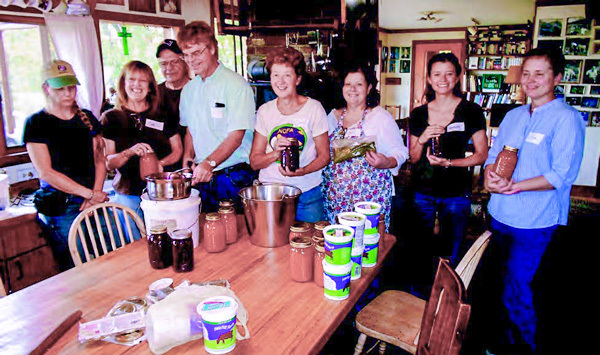 Happy food preservers show off their canned and frozen take-home products after 2012 on-farm workshop. Julie and I have always enjoyed putting food by. One year she and the kids got me an Excalibur dehydrator for Father’s Day and I couldn’t have been happier. It sits by the kitchen table most of the year quietly drying the season’s products — peaches, pears, seedless grapes and cherry tomatoes for me, and various herbs and weeds for Julie. When the kids were here they would love to make fruit rollups by mixing ground fruit with a little honey, drying it on sheets until it was like leather, and then rolling them up. We freeze all our meat and either freeze or can our vegetables and fruit for the year. That is, except for the potatoes, carrots, beets, parsnips, onions, rutabagas and various flower bulbs in our root cellar (along with a nice selection of home-made wines), and the shelves of lacto-fermented sauerkraut we make from cabbages. We don’t do much with salting or smoking, mostly because we don’t need to. Food preservation, of course, is a practical means for anyone living in the northeast to convert food when it is relatively abundant (summer and fall) into something you can eat when it otherwise is scarce (winter and spring). Modern approaches enable us to maximize the preservation of nutrients and flavor, something that our ancestors often could not do as well. The basic principle, to surround the food with an environment that will not support microbial life and thus prevent (or greatly retard) decay, is simple. Yet the many ways to do this – drying, freezing, salting, smoking, pickling, canning, jellying, cooling, burying in fat, fermenting, etc. are legion. In this issue we explore a number of these techniques so that, if you don’t already do it, you can find out how satisfying (and thrifty) a pastime it can be. True, there is some work associated in cleaning and preparing the foods, as well as processing and then storing them. But at our farm this was always an occasion for groups to get together, sit around the table, and joke or tell stories while slicing and paring, pitting and pressing, boiling and blanching. I think there are few better way to raise children to be helpful, productive, and conscious of the world than to have them help preserve food with the family. I hope you enjoy it as much as we do! Throughout history people have learned to preserve food. Those living in temperate and brittle areas had to pass through months when growing was either impossible or chancy, so they preserved food as a matter of survival. Others did it to make food suitable for long distance trade, to supply soldiers, sailors, merchants or pilgrims who were traveling, or to savor a certain delicacy out of season. Sometimes the preservation method itself added particular desirable flavors. 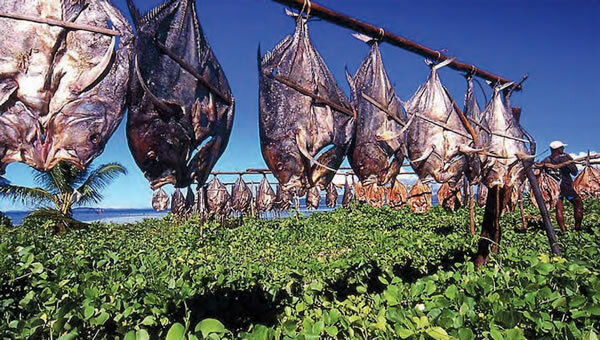 In some regions a particular foodstuff could only be enjoyed in its preserved form because it didn’t grow nearby.